Hear no evil. See no evil. Speak no evil. Most of us are familiar with the three monkeys and their advice, often depicted with actual images of monkeys covering eyes, ears, and mouth. J.D. Barker’s book tells us about The Fourth Monkey: do no evil. But the monkey in his book does all kinds of evil. He is a serial killer, nicknamed the Fourth Monkey Killer, and time is running out for his latest victim. WARNING: if you have a weak stomach or tender constitution, stop reading and find a different book. The book (and consequently this review) do have descriptions that might upset some readers. Detective Sam Porter has been hunting 4MK for over five years. It looks like they have finally caught a break when a pedestrian killed by a bus is found to be carrying a box wrapped in the distinctive style of the killer. Every previous victim was preceded by the delivery of three carefully wrapped boxes. The first contained the victim’s ear. The second, the victim’s eyes. The third, her tongue. Finally, some days later, the victim herself, always a young woman, would be found. This box contained a young woman’s ear. The man himself also had a diary in his pocket, one that told a grisly tale about a young man growing up in a house of horrors. As Porter and his fellow detectives follow the clues, they start with several unanswered questions. Was the dead man really 4MK? Whose ear was in the box? And, most importantly, where was she? If indeed her kidnapper is dead, she only has a couple of days before dying of thirst. This urgency presses the team to follow every lead, even when those leads come dangerously close to the wealthy and politically connected elite of Chicago. The Fourth Monkey shifts perspective often, usually between Detective Porter and the diary of 4MK. As the stories unfold, we realize that Detective Porter is carrying a great burden, one that inevitably affects his ability to follow the killer’s trail. And we realize that the diary is being told from the perspective of the serial killer–how much of its narrative is reliable? Meanwhile, a girl’s life hangs in the balance. 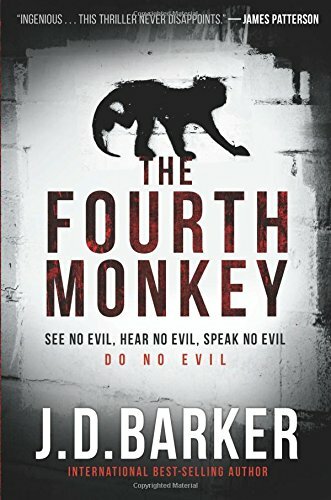 The Fourth Monkey is one of the best thrillers I have ever read. The police procedural rings true. The officers are dedicated, not perfect but not corrupt, frustrated at times with red tape but concerned about following procedure so that the result is a clean arrest and conviction, not to mention rescuing the missing girl. The diary never brought this reader to the point of sympathizing with the serial killer, but it made it easier to imagine how someone might lose his grip on appropriate choices when confronted with a distorted childhood. Of course, it is possible the diary was entirely a fiction within the fictional book–that is a possible interpretation that the author leaves for his readers to consider. All in all, a very well told story that leaves room for many of the characters to return again. Barker tells a story that is both compelling and chilling. He does a superb job of leaving small clues in the story which later bloom into full reveals. There were several times when I realized that “something” was about to happen, only to realize that Barker had left enough clues for my subconscious to go into overdrive but not enough for me to fully figure it out ahead of time. And Barker leaves just enough in the cupboard that even on the final page there is a surprise for the reader. It makes this reader quite eager to see what else this writer has in store for his audience. 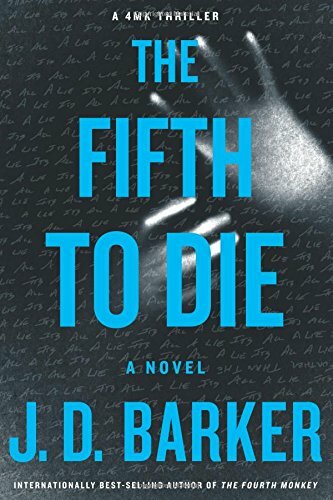 Despite the occasional gore and graphic detail, The Fourth Monkey is a book I highly recommend to any fans of the thriller or police procedural genres.